Site of the former Filene's Department Store in downtown Boston. Filene's was a Boston institution for almost a century and a quarter until it was merged out of existence by Federated Department Stores. Across the country, Federated replaced all of May Companies regional names, including Hecht's, Kaufmann's, and Strawbridge's, with Macy's. 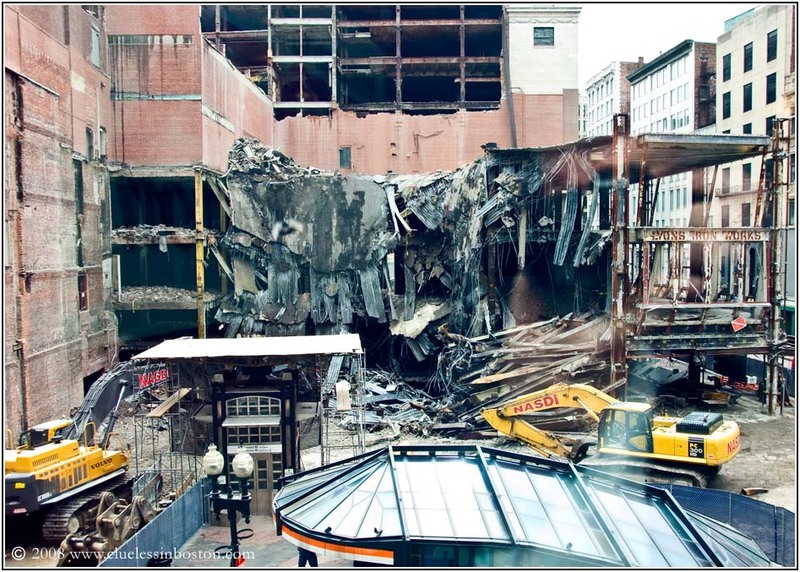 The former Filene's site is being renovated and converted into a mixed use development of luxury condominiums, retail stores, a 250 room hotel, and 600,000 square feet of offices. Here is another view of the site from Boston Daily Photo. Awwww. Isn't this the store that had the wedding dress sale/mayhem? For some reason that popped into my head when I read your title--I think I saw it on a television news show, maybe CBS Sunday Morning, or in a movie. Am I off-the-wall wrong? Thanks. Hi Clueless - good to catch up. Some of those shop names are well-known to me - all the way over here. lynette - you're thinking of Filene's Basement. They actually still do the wedding dress run, but at the Hynes Convention Center. They do have a second store, as well, and will be reopening the original store in this same building after the renovations are completed. Lynette, just to clarify what Cowbark said, Filene's Basement store was famous for its "Running of the Brides" every year and had been an integral part of the Filene's store until 1988, when Campeau bought Federated Stores through a leveraged buyout and the Basement store was separated from Filenes. Ironically, Campeau itself was eventually undone by the debt it incurred in this buyout, and was itself eventually swallowed up by a bigger fish. It was also at this time that another Boston store, Jordan Marsh was bought by Campeau and started on the path of eventual integration under the Macy's moniker. Now, Boston only has a Macy's store downtown (I don't count the other national stores at Prudential and Copley) and we, like a lot of other cities have lost our local/regional hometown department stores. I know that some businesses flourish and some fail, but the McDonaldsization of our downtowns thorough national consolidation of retail stores destroys the hometown flavor of the downtowns. It may be exaggerating to say, but at some time in the near future if you were dropped down in the center of a city's shopping district you may not be able to instantly tell what city you were in. All shopping districts will be like airports--all alike. Maybe that's progress; all I know is I don't like it. The end of an institution! Great shot! Oh, I'm with you in not liking this sort of progress! This store was on Boylston, wasn't it? I remember walking past many times on my way to Stock Boston (now also gone after many years) on the corner of Newberry Street. How sad... I loved shopping there. I am from the western side of Massachusetts, so I rarely went to the flagship store in Boston. But I was in retail for 8yrs and in fact my very first full time job was Visual Assistant at a Filene's store. It's so disheartening to see the flagship buildings ruined by "progress". As long as my former employer Lord & Taylor(once Filene's sister store)doesn't loose their 1914 flagship store in NYC there's a slight glimmer of hope for retail. "Thank you for shopping at Filene's"